Hungarian maestro László Krasznahorkai is laconic and shrewd, as practical as he is existential, capable of wresting huge laughs as well as immense profundity from the commonplace and the way in which we choose to respond to it. The Last Wolf features a classic, obsessed Krasznahorkai narrator, a man hired to write (by mistake, by a glitch of fate) the true tale of the last wolf of Extremadura, a barren stretch of Spain. This miserable experience (being mistaken for another, dragged about a cold foreign place, appalled by a species’ end) is narrated— all in a single sentence—as a sad looping tale, a howl more or less, in a dreary wintry Berlin bar to a patently bored bartender. The Last Wolf is Krasznahorkai in a maddening nutshell—with the narrator trapped in his own experience (having internalized the extermination of the last creature of its kind and “ locked Extremadura in the depths of his own cold, empty, hollow heart ”)—enfolding the reader in the exact same sort of entrapment to and beyond the end, with its first full-stop period of the book. Krasznahorkai’s method is to examine reality “to the point of madness” and he does so with majestic style and black comedy. Together, ‘The Last Wolf’ and ‘Herman’ raise a set of spiritual questions that affirms their author as one of the most important — and eccentric — writers working today. Krasznahorkai shows himself to be a writer of immense talent, capable of creating stories that are both unforgettably visceral and beautiful on the page. Don’t underestimate the pair; they might look flimsy enough to finish during a long commute but they’ll haunt you — or perhaps hunt you — long after the final full-stop has been left behind. 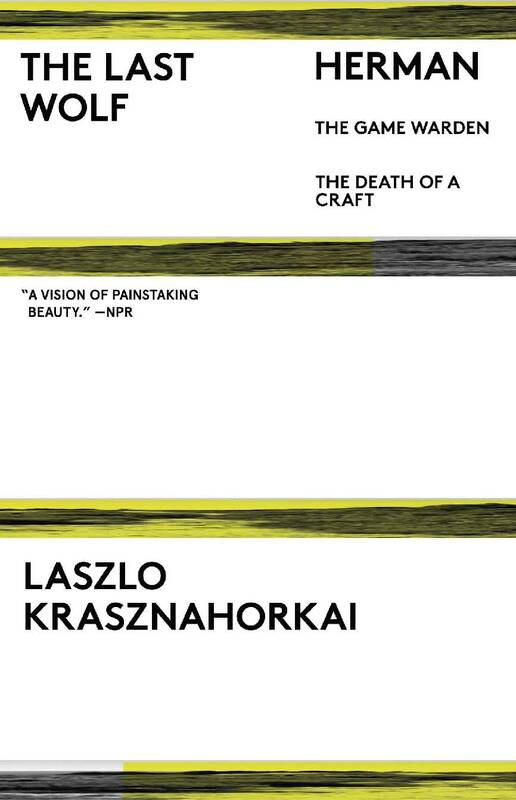 Slow, relentless forces permeate the world of László Krasznahorkai; his characters are subject to glacial currents that bear them ever onwards, an inch at a time, toward a horizon they constantly imagine but never actually behold. In so doing, they cry, or laugh, or cry laughing, or carry out the timeworn repetitions that make a life, until the moment they come up against the horizon. A seminal author of our time. Two short but maddeningly complex fictions by the Hungarian master of the postmodern… Somewhere James Joyce is smiling. Krasznahorkai is a writer who, though difficult, demands greater recognition by readers outside Hungary. Both the novellas in The Last Wolf and Herman, have an eerie, looking-glass quality. They are also very short—excellent gateway drugs to Krasznahorkai’s work… As the very best fiction always does, they bring another world—an alien world, let’s say—into our own. László Krasznahorkai is a visionary writer of extraordinary intensity and vocal range who captures the texture of present-day existence in scenes that are terrifying, strange, appallingly comic, and often shatteringly beautiful: magnificent works of deep imagination and complex passions, in which the human comedy verges painfully onto transcendence.